When I first saw this breakfast casserole in the pages of my Cuisine at Home magazine, I knew it was a must-try for my family. One of our favorite brunch dishes is biscuits and gravy. In fact, it is my hubby Dan’s speciality. Of course, his biscuits are homemade and they are fabulous. I bet the kids ask him to make it at least once a month. This casserole was fantastic! If you like these flavors, it is a must-try. In fact, my oldest daughter told me that she thinks this should be our new Christmas morning casserole. I have made my Sausage and Cheese Hash Brown Casserole the last several years and it is also a great egg casserole, but it might have just been replaced! Brown the sausage in a skillet over medium heat until cooked through. Remove sausage with a slotted spoon and place on a paper towel lined plate. Set the skillet aside, reserving any drippings in the pan. In a medium bowl whisk together the eggs, milk, cream, hot sauce, kosher salt, and black pepper. Lightly coat a deep 2 quart baking dish with cooking spray. Place ½ of the biscuit quarters in the bottom of the dish. Sprinkle ½ of the cooked sausage over the biscuits and top with ½ of the shredded cheese. Top with the remaining biscuit quarters. Carefully pour the egg mixture evenly over the biscuits. The biscuits pieces will not be completely covered with the egg mixture. Remove from the oven and sprinkle the remaining cheese over the top and continue baking for another 15 minutes. Let the casserole sit for 10 minutes. While the casserole is sitting, make your gravy. Melt the butter in the skillet over medium heat with the reserved sausage drippings. Add the other ½ of the cooked sausage back into the skillet and sprinkle with the flour. Slowly add the milk and continue cooking until gravy has thickened. Add kosher salt and pepper to taste. Serve over the casserole. Next time I make this I'm going to make it in a 9 x 13 and see how it turns out. It all fit in the 2 quart, but the biscuits rose quite a bit. If you try, it be sure to let me know! My stomach is grumbling just reading this post! Off to make myself a sausage egg and biscuit casserole! Thanks so much Shauna! We really appreciate it! Completely agree about brunch! And the casserole looks delicious. Thank you for linking to the In and Out of the Kitchen Link Party. Hope to see you next week. So smart! 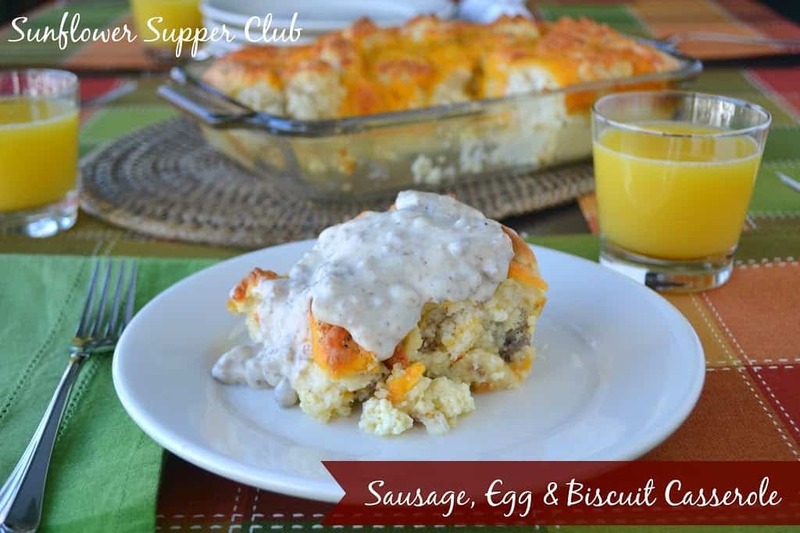 I never thought of combining biscuits with sausage to make a breakfast casserole. Yum!